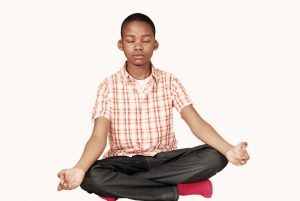 There’s a cutting-edge technique emerging to ease the suffering caused by mental health problems in young people: Yoga therapy scientifically applies the tools of yoga to target stress, emotional symptoms, and problem behaviors in children and adolescents. It’s a practical, effective, and cost-effective modality that has no known side-effects and can be done alongside other therapies and medications. I have become increasingly excited as I integrate this powerful therapy in my work as a pediatric mental health nurse. My patients report that yoga practices help them feel less stressed, depressed, and anxious. They share stories about how the breathing techniques they’ve learned are leading them to calm and success at home, school, and in other situations. Recently, an inpatient youth shared that before our practice his anxiety was at a 10 on a scale of 0 to 10; at the end of the practice, he rated his anxiety at 1. I’ve often watched agitated or anxious children come to the yoga mat to practice. Initially, I might see them tapping, wiggling, and with a whole range of anxious behaviors and facial expressions. After the practice, I typically see calm, quiet, and peaceful children looking back at me. The beauty of yoga as a therapy in mental health is that it works via both “top-down” and “bottom-up” regulation. Yoga works top-down through the brain and mind with practices such as mindfulness, meditation, and yogic concepts; traditional talk therapy is another kind of top-down intervention. Bottom-up regulation is created by using breathwork and yoga postures, which also helps kids process and transform emotions. Put simply, the mind can assist the body and the body can assist the mind to calm and regulate emotional distress. If a child is able to come to a place of relaxation in the mind and body, healing can begin. Therapeutic breathing especially works well for children and adolescents because it’s easy, accessible, and convenient. Several psychiatric disorders include symptoms of anxiety, agitation, or emotional dysregulation in which the nervous system is unbalanced or overstimulated. Many yogic breath techniques can calm and soothe the nervous system. Yoga therapy can also help the brain and the body understand different ways of interpreting and responding to stressors. Our brains have the ability to strengthen positive emotions and to decrease ineffective coping. Teaching kids that the peace they experience after a yoga practice is a feeling they created themselves empowers them. Giving them new tools that are effective and easy to use builds confidence. From confidence, we build hope that there is a way out of the emotional pain, and from hope, we can build resilience and help our children to be happier and healthier. Find a certified yoga therapist here.